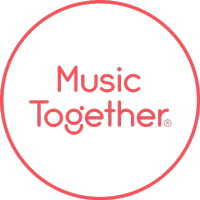 Many of you may have enrolled in Music Together® classes because you want your children to learn some fundamental musical skills. And with time and exposure, every child can achieve what we call basic music competence: the ability to sing in tune in any key and keep the beat accurately with the whole body. How exciting! But did you know that music learning supports many other kinds of learning as well? You may have noticed that we often sit in a tight circle during class, and the adults move from tapping our knees, to clapping, to tapping one another’s hands, moving high and low, etc. We really have to concentrate and follow the changes so that we move together! This gives our children the opportunity to build focus along with the grownups as they observe our changes in movement. When the group switches between one movement and another, it also builds cognitive flexibility – the ability to shift between concepts and handle multiple concepts simultaneously. Cognitive flexibility is an important executive function that is crucial to learning! Do you ever use your book at home? (We teachers hope you do.) When you use the book together with the music, you are supporting pre-literacy skills. An example of this would be singing “Pussycat,” which is part of our current Summer Songs 3 collection, while pointing at various parts of the illustration – pointing to the cat on the word “pussycat,” pointing to the child on “queen.” Picture recognition is an important precursor to reading readiness. You could also try making up a musical story to fit the illustration, which builds oral language skills and vocabulary. Asking your child questions like “Where did the pussycat go?" "Why did she go to London?" "What happened next?” supports memory, sequencing, and narrative skills as well. You can also try pointing at each word on the page as you sing the song, which builds letter/word recognition. Research suggests that a child with strong pre-literacy skills is better able to benefit from reading instruction when school begins. Even babies who are not yet working on specific pre-literacy skills can build phonological awareness (hearing the sound structure of words) and listening ability. Movement is a part of every class, and we hope you are incorporating it into your music-making at home, too. Not only does movement feel good, but it also benefits your child in important ways. From infancy through early childhood, children are working on gross motor skills, movements which use large muscle groups and the entire body. It’s a key reason why we dance in class! Dancing and moving to the beat strengthen children’s coordination, body awareness, and balance. You’ll notice that in class, we frequently “cross the midline,” reaching across the body with arms and legs; when we do this, we are increasing bilateral coordination, so that your child will be able to use both sides of the body together. We are also working on fine motor skills, coordinating hands and fingers. When your child picks up a mallet to play a resonator bell, or tries to tap the beat using fingertips, he or she is building fine motor skills. There are so many ways in which music learning supports learning in other areas – your child’s language development, cognitive growth, physical development, and social and emotional development are all fostered every time you make music together. What are some of the ways you’ve observed your child learning through music?